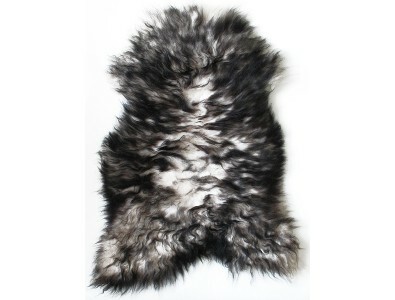 Cowhide Rugs, Patchwork Rugs, Icelandic Sheepskins, Reindeer Rugs – quite a choice! A cowhide rug adds that touch of sophistication to a room, and if you have been considering a cow hide rug then please take a look at our collection. The one that you choose is the one that you will receive, and they range both in colour and size. If you have considered a cowhide rug but want something a little more structured, or you need it to fit a specific area and need a special size, then take a look at the examples of our patchwork rugs. Each patchwork cowhide rug is specifically made for us by South American artisans, and the styles, colours and designs of each patchwork can be tailored to your specific requirement. So you might want to change the black colour to brown, or you might want a blue and white patchwork cowhide rug. Perhaps you need a long runner for a hallway, or something very large for the company boardroom. There are hundreds of examples to spark your imagination, and we are adding to the range all the time, but if you have your own idea for your patchwork rug, then give us a call and let’s discuss it. Of course, you might decide that there are areas of the house where you would prefer something a little softer, perhaps either side of the bed, or directly in front of the fire; then perhaps one of our Icelandic sheepskin rugs might fit the bill. Again, we have a range of sheepskin rugs, and the one you select will be the one you receive. The Icelandic sheepskin rugs have a denser and longer fur than the more traditional sheepskin rug, and every rug is unique. You will be amazed at the softness, the silky texture and the length of the wool on our sheepskins. And finally to temp you, we have some reindeer skin rugs, each one different, each reindeer hide unique in its colouring and markings. If you like the ski chalet look, then consider a reindeer hide rug either draped across a chair or sofa, or at the end of the bed. 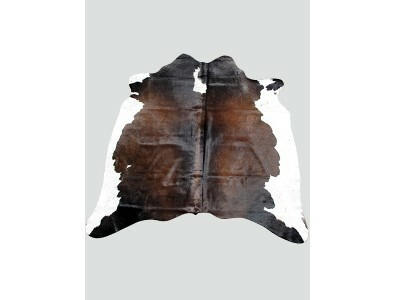 Favoured by the top interior designers, the cowhide rug has grown in popularity over recent years. Every piece is unique and unrepeatable. 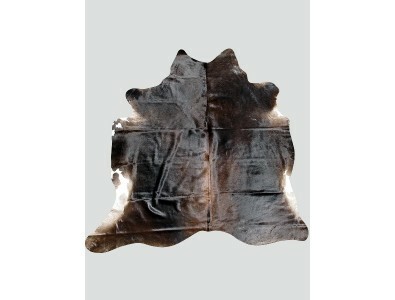 Your cowhide rug will be the only version like it, and it will add instant style and gravitas to your home. Purchase a large cowhide rug to make a fetching centrepiece to your living room or pick up a small cowhide rug for your hallway or spare room. Our cowhide rugs are available in a variety of blacks, browns or in a tri-colour, or a popular zebra print design for a more exotic feel. Whichever rug you choose it is guaranteed to make a stunning design statement in any room. Remember, every single cowhide rug that we offer has been individually hand-selected with quality being the utmost priority. Add us to your favourites because our stock is continually changing, and keep coming back if you don't immediately see a pattern you like. Some cowhides may have small marks or 'brands'; this is not considered a fault, but just a natural feature of a natural product. 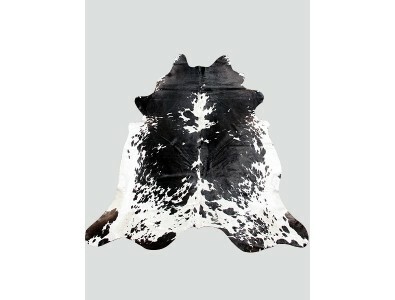 You will receive the cowhide depicted in the product photograph unless otherwise stated. This is probably the largest collection of patchwork cowhide rugs you will see anywhere, and we are adding new designs all the time. All of the designs you will see are available in a number of size options, but apart from that they can also be adapted to the colours of your choice. For example, if you see a design you like but it is in black and white and want brown and grey...no problem, just give us a call. Or the patchwork rug you like doesn't have a border but you would like a thin black leather border....no problem, just give us a call. We can discuss your requirements with you and make suggestions and advise if required. All of our cowhide patchwork rugs are specifically made for us by South American artisans, with an approximately lead time of 3 weeks. Icelandic sheepskin rugs come, as you may have guessed, from Icelandic sheep; a rugged, almost wild breed that are often left to roam the hills and valleys of Iceland pretty much the same as they did when the Vikings were there. They are renowned for their dense, long, silky wool, and colours can vary quite considerably. As you will see from our selection of Icelandic sheepskin rugs, there is quite a variety, which makes them even more desirable because each one is unique;apart perhaps from the plain ivory/white or black/brown sheepskins. Some of the colours, such as the grey and the rusty brown are often difficult to obtain, and so we can not guarantee having some of the options available all the time; so grab them while you can! 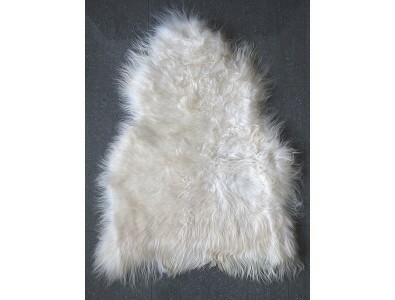 2 colour Icelandic sheepskin rug. Cream base with brown dyed tips. The rug photographed here is the exact Icelandic sheepskin rug you will receive. See 'Data' below for size. 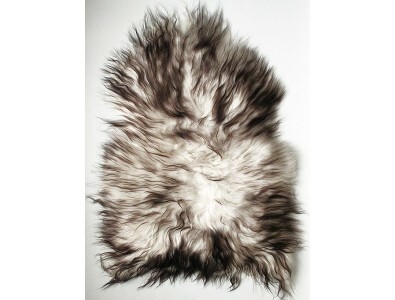 2 colour Icelandic sheepskin rug. Cream base with black dyed tips. The rug photographed here is the exact Icelandic sheepskin rug you will receive. See 'Data' below for size. 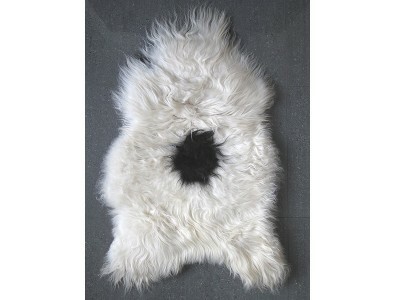 Black and ivory white Icelandic sheepskin rug. Superbly soft, 100% natural. The rug photographed here is the exact Icelandic sheepskin rug you will receive. See 'Data' below for size. 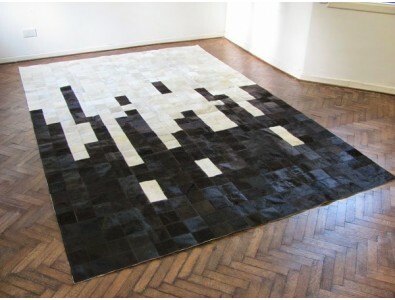 A very modern and contemporary patchwork cowhide rug in black and white. Looks great in large apartments and lofts. Viewed from one end it could be the Manhattan skyline. An interesting combination of pale grey brindle centre, brown brindle middle and black border make this a striking design for a patchwork cowhide. 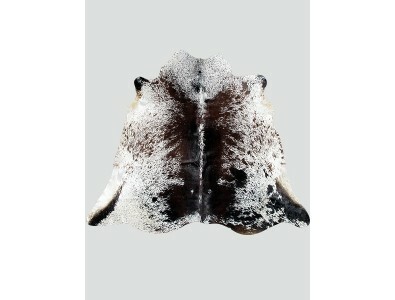 A stunning combination of black brown and white make this luxurious cowhide rug design. Particularly suited to modern colour schemes. 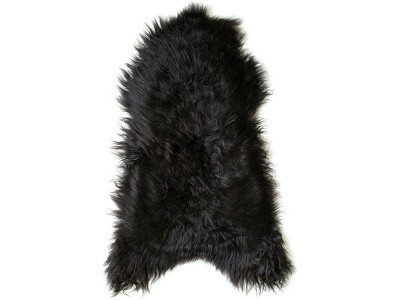 Black brown Icelandic sheepskin rug. Superbly soft, 100% natural. The rug photographed here is the exact Icelandic sheepskin rug you will receive. See 'Data' below for size. This rug is almost black. 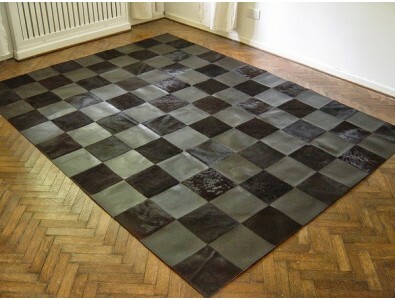 This patchwork cowhide rug has alternating black cowhide and black leather squares. Contemporary, modern, and a real design statement. 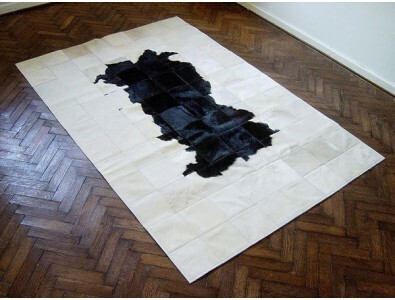 More unusual than your average patchwork cowhide rug. 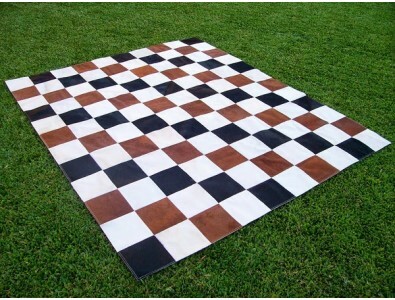 An unusual twist to the traditional chequer board pattern, in brown black and white/ivory. Shown here produced from the suede side of the cowhide. 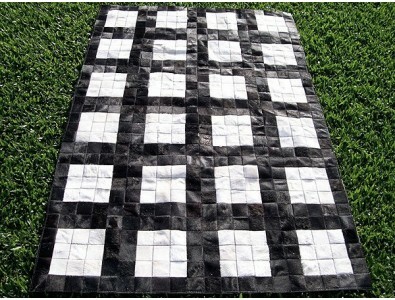 A grid pattern forms the design for this black and white patchwork cowhide rug. Sizes need to be clarified because of grid pattern. Please contact us before placing an order for this design. A strong design statement, this black and white patchwork cowhide shows what many think of as 'cow design'. 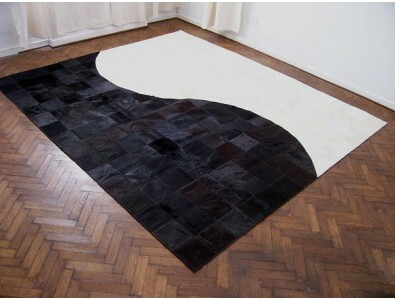 A black and white patchwork cowhide rug with ivory/white around the outside and black centre. Colours could be reversed. 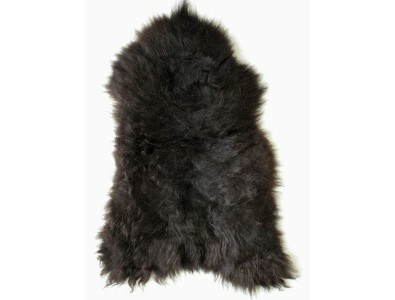 Blacky brown Icelandic sheepskin rug. Superbly soft, 100% natural. The rug photographed here is the exact Icelandic sheepskin rug you will receive. See 'Data' below for size. This rug is almost black. This rich brown patchwork cowhide rug is made from small squares of quality cowhide, and finished with a matching cowhide border. 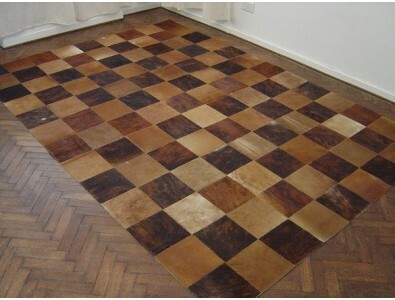 Brown and tan chequer board pattern cowhide patchwork rug. Alternate plain and patterned squares. 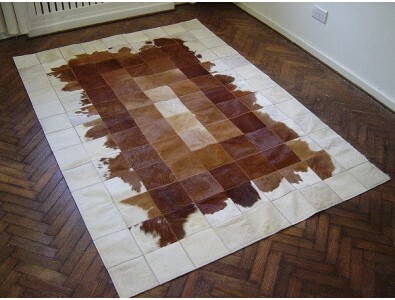 A brown and white patchwork cowhide rug with ivory/white around the outside and brown inner with a light centre. A carefully constructed patchwork rug. 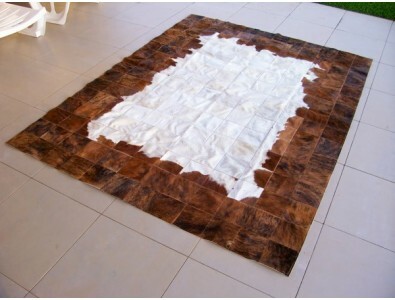 Brown brindle, plain brown and ivory white cowhide have been used to make this patchwork rug. Ivory white centre focal point and brown outer. A real design statement. 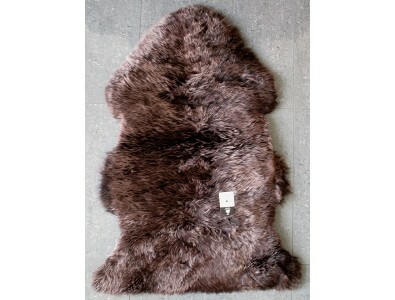 Traditional Australian sheepskin rug in a rich chocolate brown colour. Shorter haired than our Icelandic sheepskins. A sheepskin rug as most people imagine them. 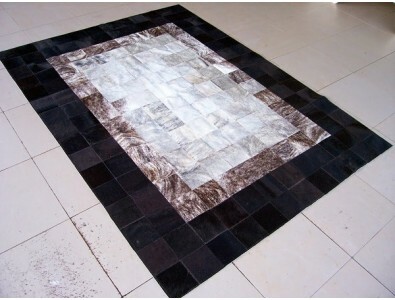 A contemporary black and ivory/white patchwork cowhide rug that will fit into any modern decor. A real statement piece. 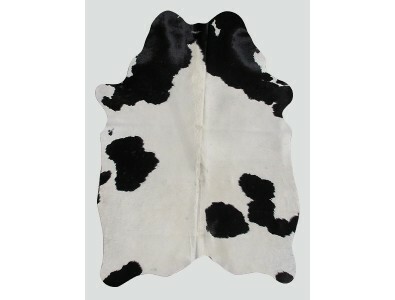 Medium sized black and cream cowhide rug. Nicely marked and good shape. A good sized cowhide for smaller rooms. See dimensions below. 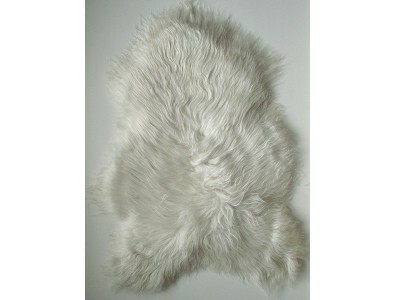 100% natural creamy white Icelandic sheepskin rug. Superbly soft, ivory, natural, creamy white in colour. The rug photographed here is the exact Icelandic sheepskin rug you will receive. See 'Data' below for size. 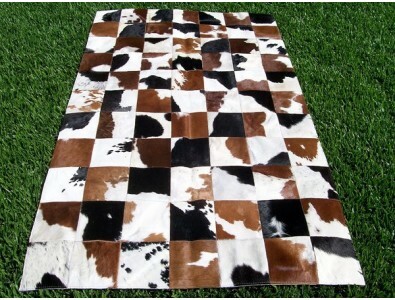 Medium sized dark brown and white cowhide rug. Beautiful rich colour and good shape. A good sized cowhide for smaller rooms. See dimensions below. 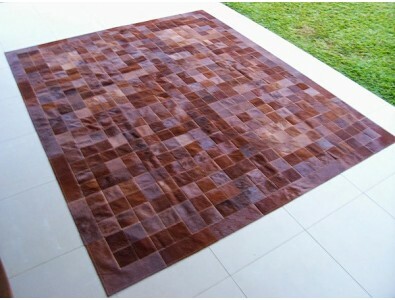 Large dark brown cowhide rug. Very glossy with rich colours. Perfect against a lighter background. See dimensions below. 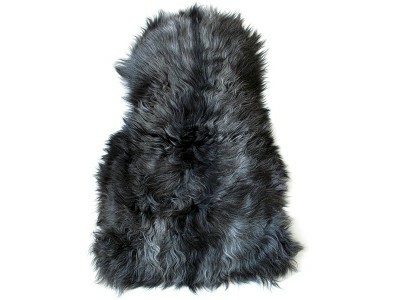 Dark grey Icelandic sheepskin rug. Superbly soft, 100% natural. The rug photographed here is the exact Icelandic sheepskin rug you will receive. See 'Data' below for size. 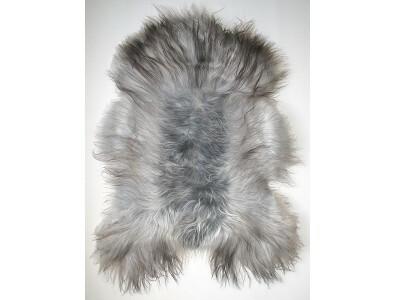 2 tone grey Icelandic sheepskin rug. Superbly soft, 100% natural. The rug photographed here is the exact Icelandic sheepskin rug you will receive. See 'Data' below for size. 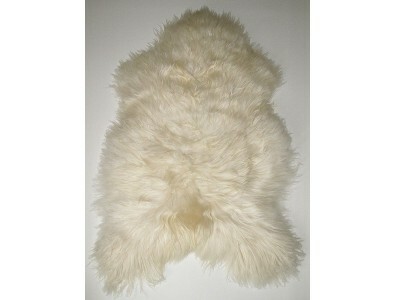 100% natural ivory white Icelandic sheepskin rug. Superbly soft, ivory, natural, creamy white in colour. The rug photographed here is the exact Icelandic sheepskin rug you will receive. See 'Data' below for size. 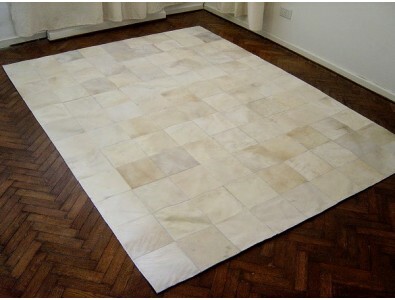 A plain yet striking patchwork cowhide rug produced from a combination of off-white, cream and ivory cowhide squares. One of our most popular designs. 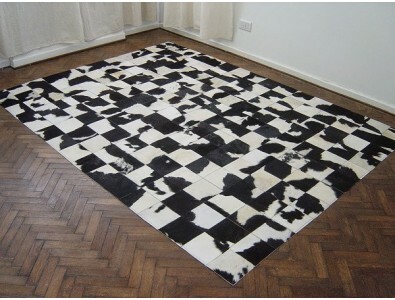 Large black and white cowhide rug. Good colouring with small amounts of brown; evenly marked and a good shape. See dimensions below. Large brown and white dappled cowhide rug. Good colouring with dark brown centre and dappled brown towards edges. Evenly marked and a good shape. See dimensions below.